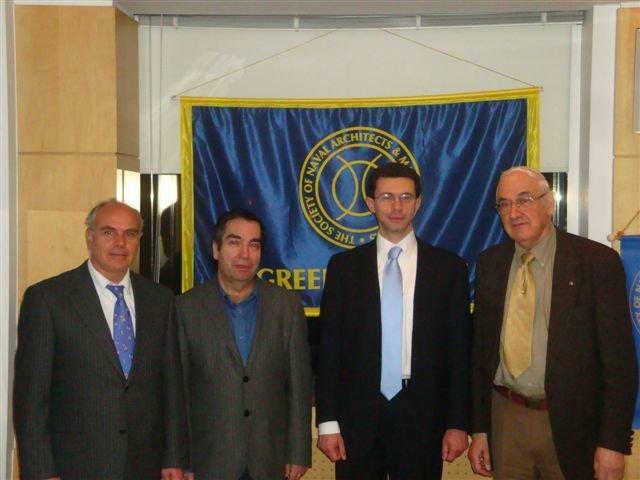 On March 18th 2010 the Greek Section held the 8th technical session of the season at the Maran Auditorium. The audience was dominated by young students/engineers who came to cast their vote at the local student section elections. The topic of the technical presentation was related to the work at the National Technical University of Athens on Emission control and reduction. The speaker Dr. Chryssakis presented his research work on the analysis of various alternatives to reduce the emission of nitrogen oxides and satisfy the large reductions dictated by the MARPOL Annex VI, Tier III regulations. He explained that it is far cheaper and faster to perform analytical computations than the full experimental investigation. This way, various parameters influencing the content of exhaust gases in nitrogen oxides can be investigated and pinpoint what is needed towards reduction without the expense of increasing the fuel consumption. Dr. Chryssakis specifically presented his work on the effects of advanced injection strategies, direct and indirect water injection into the combusting media, exhaust gas recirculation, and valve timing. Utilization of advanced numerical analysis tools such as the CFD code KIVA-3 and genetic algorithms is necessary to complete the complex computational cluster in the theoretical investigation. Optimization of the fuel injection timing resulted in drastic NOx reduction without significant increase in the specific fuel consumption. The final conclusion of the presentation was that a combination/cocktail of techniques is needed in order to achieve the highest possible effect on the nitrogen oxide reduction. Following a lively question and answer session, the evening ended with the relaxing social hour with refreshments and finger food. C. Chryssakis, Author; P. Lalangas, Chair.